The other day I got a message from my friend Albert Hankel at SURF in the Netherlands. SURF is the Dutch equivalent of Jisc. Albert told me that SURF and colleagues in Dutch higher education had been working on a “Green ICT Maturity Model” as part of SURF’s programme of work on Green ICT. The aim of the model that SURF has produced is to allow organisations such as universities and colleges to fairly quickly get a handle on their progress to best practice and outcomes in Green ICT. Albert told me that the developers of the model drawn on the wisdom other maturity models, among them the UK Government’s Green ICT maturity model. In SURF’s work on Green IT they have made the distinction between the “Greening of IT” and the “Greening by IT”; that is, between the work to reduce the environmental impact of ICT operations, and the harnessing of ICT to improve the environmental performance of the rest of the organisation’s activities. Maturity models and self-analysis frameworks are not new, of course – Jisc has produced a clutch of them over the years, helping organisations track their development in areas ranging from Relationship Management to Records Management. And there are, of course, other Green maturity models around – as well as tools for Green IT related activity. among these I would count the Green Grid Data Centre Maturity model, the EU Code of Conduct for Data Centres and the Jisc Suste-IT tool that allows an as lightweight approach to carbon footprinting IT as one requires. What I like about the SURF approach is that it brings all these elements together, and in its precise use of language (someone has done a good translation job from the original Dutch), helps organisations start to get a grip on their development. The way I would see this being used is as an essential first step in assessing maturity in the relevant areas, with the outputs being used to help allocate priorities and resources for developing action plans and remedial projects. By a periodic further visits to the model it should be possible to map improvements over time. 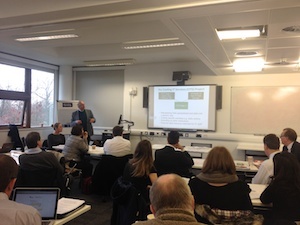 One thought from Michael Bane at The University of Manchester was for those with an interest in this in the UK to have a go at completing the model of their own institutions and then to compare notes. I’d be happy to collate results. Last Wednesday we had the latest in the webinar series that Jisc is running in association with the EAUC. This one was “Efficient Buildings – or Heat and Light by Timetable“. Follow the link for a recording of the webinar or have a look at the associated guide. One of the ‘ah-ah’ moments in this work for me was the graph that Sue Holmes, then Director of Estates at Leeds Met showed me. The point that it illustrates is that in the late afternoon and early evening, even though occupancy and use of the campus is falling away, the amount the university spends on electricity rises! The reason for this paradox is that the university, like other big users, pays for its electricity by the half-hour. At 16:00 the cost per unit nearly doubles. This hike continues through to 19:30 when the rate returns to the standard day rate before going down to the night rate at 22:00. The ah-ha moment was the realisation that this gave a clear pointer to the time of day to focus on to make difference to the energy footprint of the campus. By rationalising the rooms used for teaching – closing down whole floors and even buildings as the occupancy levels fall, a real difference to the energy use can be made. We are at the University of York for a workshop to start the process of engagement around the developing outputs from the Costs of IT Services project (CITS). The fundamental question is “how much does your IT cost?” Not, how much is in the budget, but how much does it actually cost. How much does this or that service really cost? The reason for asking these questions, apart from the obvious need to be on top of expenditure and in control of your destiny, is that it gets hard to make sensible judgements around central versus local provision, or in-house versus cloud solutions, if you do not know how much things are costing you in the first place! Many questions got raised – like apportioning costs of things like the network. How do you allocate the network costs to, say, the student record system or email? Or should you bother? Is the network just something that you must provide because without it, nothing else would be possible? The audience was a good mix of IT managers (some senior), HPC and Systems managers, business analyst, and various people occupying variations on finance-related roles. The meeting was hosted by Heidi Fraser-Krauss, IT Director at the University of York. The University of York have done some of the hard thinking on this subject, as primary fieldwork partners for the Costing IT Services project. One of the issues they faces is where to stop counting. York has quite a small central IT team, so much development of existing systems actually happens in the departments, while IT Services run the infrastructure that makes these things work. For example, IT services run the computers that power the student record system, but development work on that system is the responsibility of the Registry. So what do you count to get a true picture of the cost of that service? And cost to whom? Just the cost to IT Services, or the cost to the university? What are the models for providing support for research computing and and how does the cloud fit into this? How do we really compare the costs of cloud (which will be a commoditised price that includes the capital costs, running costs, cooling and power conditioning overhead, security, resilience and network costs, with in-house version where the costs of many of these items are either not available or are very hard to get hold of and will be shared with a myriad of other services? What price would you put on being sure that your cloud provider will still be there next week? Peter James raised the example of Nirvanix, a US cloud provider that gave it’s users 14 days to remove their data as it went into bankruptcy this year. One issue that surfaced in a number of points through the day was the danger of charging for IT services internally, as this is simply to make more likely that departments will simply go and get their own cheaper (at the point of purchase) IT kit, but then shout for help when things go bad on them. Following the successful initial webinar on 14th November on the subject of engaging users (staff and students) in environmental initiatives – particularly those involving the use of dashboards or other electronic means to display energy usage. The next webinar is on data-centre energy efficiency – and features input from three sources. The team from the University of Aberdeen, hot from the glory of winning both a Green Gowns award, and the BCS IT Industry awards. Brian Henderson (Head of Service Management) and Peter Esson (Data Centre & Operations Manager) who oversaw the highly successful shared service data-centre at Aberdeen that not only got people together, but delivered a data-centre that went from a PUE of around 2.4 to a PUE of 1.07. The associated guide will be published next week on the Jisc website. Further webinars and associated guides will follow through to the end of this year and into next. Along with our friends at the Sustainability Exchange, Jisc is putting together a set of webinars to wrap up some of the salient findings from the Greening ICT Programme. The first webinar of the series is on the 14th November – and is on the subject of Engaging Users – or “Energy Dashboards are not enough – you need to engage your staff and students to make real impacts on energy use on campus”. Dr Richard Bull from De Montfort University (Green ICT Category Green Gown winner in 2012) worked on a a series of Jisc funded projects that explored these issues from a socio-technical perspective. Richard’s findings were broadly that, while metering and then displaying energy usage was a useful first step, the real challenge comes in finding ways of designing interventions to connect users up to the ways that their changes in behaviour can affect energy usage. At Coventry University, Elise Smithson worked with IT colleagues and the students union to investigate the way that game type approaches could be made to work in helping students in university halls of residence understand how much energy they were using and then take responsibility for doing something about it. The webinar will feature short presentations from these two speakers and will also feature a wrap up of other initiatives that Jisc has funded in this area, with lessons learned. Jisc will also be launching a new guide to improving user engagement on the same day as the webinar. Check back to the Sustainability Exchange Events page for bookings and further information. Drawing together a number of threads of the Greening ICT Programme, Jisc, in association with our partners in the EU funded e-Infranet initiative are running a free one day workshop on this subject in Liverpool on the 17th June. What we will be doing is looking at some of the economic and financial constraints on DC planning and operations. We have a good line up of speakers and participants. Still a few place left. We are exploring is the problem that many investment decisions are clouded by the way that many IT related costs are hidden from organisations and end-users. This makes decisions about Cloud or Shared Service type solutions, with their capacity to deliver benefits through economy of scale, difficult to make. I don’t say that we have the answers, but the workshop should be a good place to be more certain about what the questions are. We will be “amplifying” the workshop – a live blog and twitter stream will be running and their will be a rich media collation of the proceedings to follow. I’ll post links here in due course. As part of its Greening ICT Programme, JISC is pleased to invite interested parties to a series of briefings about the EU Code of Conduct for Data Centres. The Code of Conduct was launched by Defra and the European Commission’s Joint Research Centre (JRC) in 2008 in recognition by the EC that data centres are heavy and often inefficient consumers of energy – and that this problem is only set to increase. Escalating costs of energy have focused the attention of senior management across all sectors on energy efficiencies and are driving renewed interest in understanding how measures in the EU Code of Conduct could help cut costs and carbon emissions. Defra, via its Market Transformation Programme (MTP), helped develop the Code of Conduct providing specific input on reporting and monitoring. What are the benefits are and how to participate? Experiences from current participants in the Code of Conduct. The briefing will be of interest to Data Centre Managers (Facilities & IT), Management driving a Green agenda, CSR, Purchasing Managers. This will be an ideal opportunity for people working with data centres in the higher education sector to get a good overview of the code of conduct and hear how their peers are implementing it in practice. There will also be an opportunity hear about some technical innovations in metering and measuring for data centres. The briefings begin at 14:45 for 15:00, and will conclude by 17:00 or 17:30 after some short presentations and a question and answer session. Afterwards there will be an opportunity to discuss the issues raised and to network with colleagues over a glass of wine and some snacks. For the really keen, we propose adjourning to a suitable local pub for more refreshment and further discussion. The briefings are free of charge, but we do ask that you register your intention to attend at: https://survey.jisc.ac.uk/jisc_eucoc to give us some idea of numbers to expect. Two bits of good news this week about recognition and/or further take up of the work of the Greening ICT Programme. First up on Monday morning was news from the team at De Montfort (Richard Bull, et al) who ran the DUALL and Greenview projects. First of all they have had a paper accepted for the upcoming RCUK Digital Economy conference in Aberdeen. Secondly they have just learned that they have been awarded £225,000 from the EPSRC to take the work forward as part of the research in the wild (digital economy) programme to develop a social media/iphone app to test in Leicester CIty Council engaging staff with energy behaviours. Secondly I heard from Lucy Nelson at the University of Central Lancashire that the iBuilding project that we funded there has been nominated for a THE award in the “Outstanding Contribution to Sustainable Development” category. well done to all concerned – and that’s before we know the outcomes of the Green Gowns second stage.